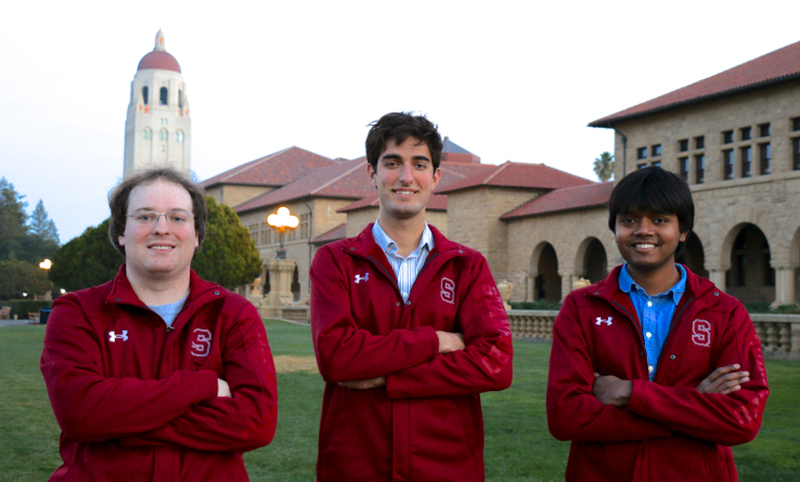 In December, Yahoo purchased PeerCDN, a startup company founded by three Stanford computer science graduates: Feross Aboukhadijeh ’12 M.S. ’13, John Hiesey ’11 M.S. ’12 and Abimanyu Raja ’13. PeerCDN has created a next-generation content delivery network that would both reduce bandwidth costs and increase efficiency for websites. Although the terms of the acquisition have not yet been disclosed, Aboukhadijeh, Hiesey and Raja have joined Yahoo’s media organization. All three startup founders had early starts in the world of computer science, from Internet work to experience in electric networks. Aboukhadijeh’s interest in the web began in eighth grade when he wanted to build a website, and he first learned HTML using a program called Microsoft FrontPage – which allowed him to format his own page while simultaneously generating the HTML code for the site in a split-screen display. While attending high school in Singapore, Raja was hired by Mozilla to work on a Firefox extension he had been developing. Hiesey, on the other hand, originally thought he would major in physics or electrical engineering. Hiesey explained that his father worked on electronics and taught him about circuits and programming around fifth or sixth grade. Aboukhadijeh explained that as a group, the three founders aim to surprise people through their projects, which have included an application that displays and records what everyone on an open Wi-Fi network is doing and a quadcopter controlled by an Oculus Rift Virtual Reality headset. PeerCDN itself was one of those projects with the goal of surprising people. The product uses Web Real Time Communications, which allows peer-to-peer communication in the browser. Used in applications like Skype for videoconferencing and Spotify for music sharing, peer-to-peer communication eliminates the middle man and allows direct connections between users, therefore reducing costs for the website hosting the material. Through a peer-to-peer network of a site’s visitors, PeerCDN enables the majority of a site to be hosted by users. By reducing bandwidth costs, PeerCDN also eliminates one of the main limiting factors placed on websites. Furthermore, the software is easy for developers to implement and does not require users to install anything. Although the original goal of PeerCDN was not to join a larger company, Aboukhadijeh, Hiesey and Raja plan on working for Yahoo for some time. In the long run, however, Hiesey is considering pursuing a Ph.D., and Aboukhadijeh also wants to return to complete his masters but has not yet determined what year he will finish. Contact Kylie Jue at kyliej ‘at’ stanford.edu.